The best way to start the day is with a hot, hearty breakfast. But when you’re in a hurry and on the go, that can seem impossible. 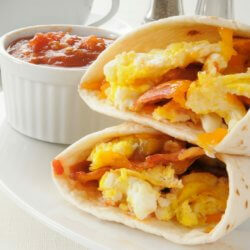 Enter the make-ahead, freezer No Name Bacon breakfast burrito! All you need is about 30 minutes and a “burrito assembly line” to stock up on a dozen tasty breakfast treats. Cook your No Name Bacon according to package directions. Break your eggs into a large bowl, add the milk and whisk together. Season with salt and pepper. Use a large saute pan over medium heat, add butter or olive oil. When butter melts or oil is “shiny,” (not smoking) scramble your eggs to the desired consistency. If you like your eggs on the runny side, be sure they’re at least cooked all the way through. Let bacon, potatoes/vegetables and eggs cool completely before assembling burritos. Set up your burrito assembly line: Tear off large, square shaped pieces of aluminum foil and lay them out in a line. Place one tortilla on each aluminum foil square. Sprinkle your desired amount of cheese shreds onto each tortilla. Add the bacon, eggs and potatoes/veggies. Fold the burritos and tightly roll them up, making sure the ends are tucked in. Wrap the burritos in foil and freeze. To reheat – Remove the burrito from the foil and place on a microwave safe plate. Microwave for 1-2 minutes until heated all the way through and the cheese is melted. Enjoy your hot breakfast — spice it up with salsa while you’re at it!